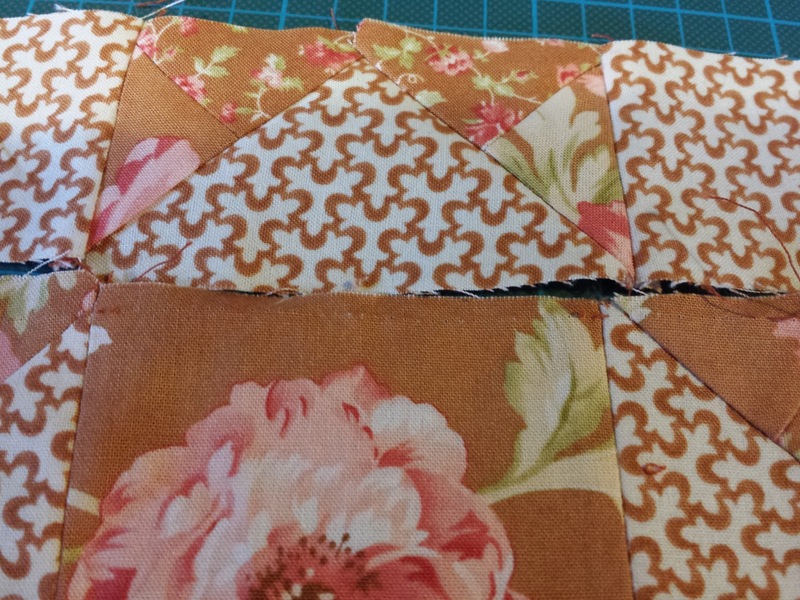 I've decided I may never make a full-sized quilt. It's not that I've decided consciously to not attempt it, but I just find I love doing small projects far more. 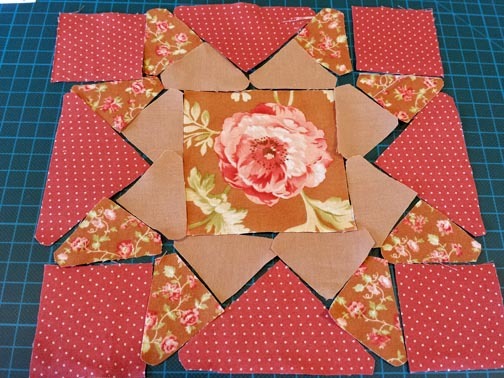 First, as an update from my last post, I've abandoned the quilt-along group. They are doing absolutely beautiful work but I fell flat on my face with the first block. First attempt was a disaster. You can see from the lower panel that already it's out of sync....the triangles don't match the same way. Believe me it got much worse than this..... so I started over. This time I made certain that all my pieces were accurately and uniformly cut, then I laid them out before sewing just to orient myself as to what goes where. Second attempt at "Addie" with different fabrics. So far, so good. But when I actually sewed it, it was as much a disaster as the first one! I love the book, The Farmer's Wife 1930 Quilt Sampler and the writing, but IF I ever try one again, then next time I'll pick an easier block! My mug rugs, however (see previous blog entry) turned out very well. No pattern-- I just winged it. They were fun to make and not at all fussy or difficult. It probably was too easy and I chose the lazy option, but at least they're done now. 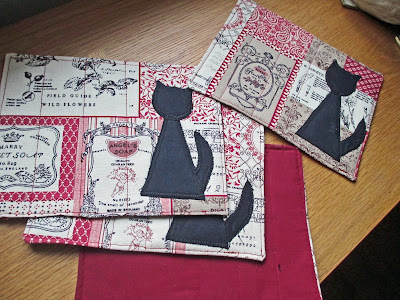 First I used some heat bondable material to bond the cat silhouette to the front piece. 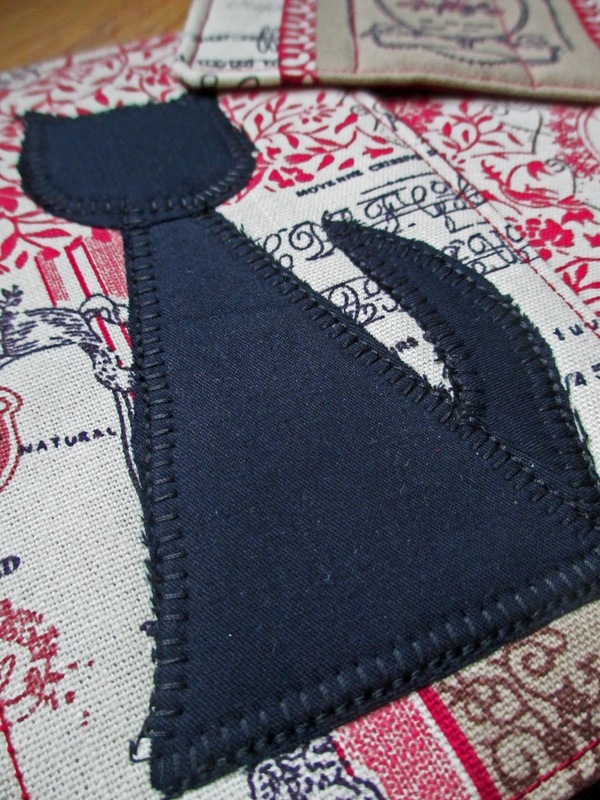 Then I sewed a blanket stitch around the silhouette with my machine. Once that was done, I assembled the sandwich, using a fairly lightweight batting. 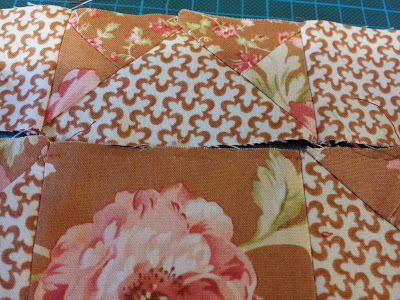 After I turned the back lining inside out, I ran some quilt lines from top to bottom. If I made more mug rugs I think I would also have run horizontal lines and perhaps a contrasting binding, but for these I decided this was enough. One more little thing is the new magazine, Simply Moderne. I just happened across it at WH Smith's and fell in love with some of the quilts, described as "modern" quilts, and other projects. No blocks or at least not many, lots of applique and just very different. This is the first ever issue so I'm looking forward to the second one. It's published by the same publisher as the magazine Quiltmania. This issue had articles about USA quilters and shops, but I suspect that this will change as it is geared toward UK readers. If you go to their website, you can browse some of the pages electronically. The magazine is a bit pricey at £11.99 but it's 128 pages where other quilt magazines are only 98 pages. And the last little thing is that I went to a local quilt show here in Whitstable and met the nicest women, I believe most were from Abbey Patchers and Thanet Quilters. There were some lovely quilts on display, at least three different trader tables (I think I bought something from each of them!) and a tombola. I won the tombola (TWO prizes!) for the first time in my life -- two beautiful patchwork cushions. There is another quilt show in Deal, Kent this weekend. I hope to go to that one, too.